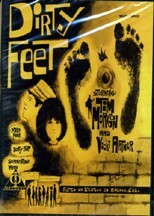 1965 feature film, shot in 1964, about Balboa folk singer Tim Morgon, shot on location at the Prison of Socrates coffee-house. To watch this movie is to be transported to a way of life that no longer exists, with shots of Morgon's cool girlfriend Vicki passing out flyers to surf dwellers near the Balboa Pier, and rowdy folk music enthusiasts tearing up the joint by movie's end. This is where the beatnick scene, folk music and sufring cross paths for a brief moment in history!